I am the LMTC Director at a 5th and 6th grade school. I love reading, trying out new technology and sharing resources. 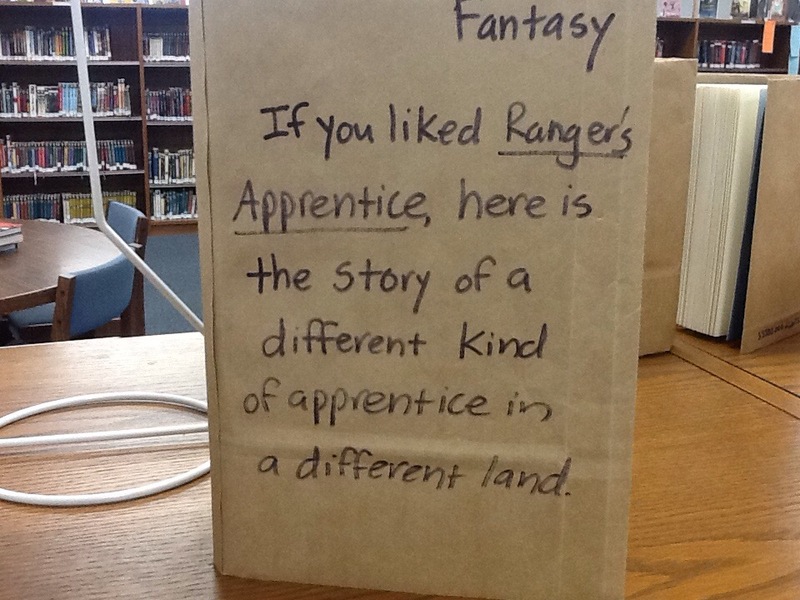 Students can now guess which book is in the bottle at the library in anticipation of next week’s Scholastic book fair. Students shake up the page pieces to look for character names, illustration fragments and other clues. (We used a book that could not longer hold up being circulated for this project). Our fall bookmark contest continues. Students submit designs. We will then choose four of the designs to copy onto cardstock. 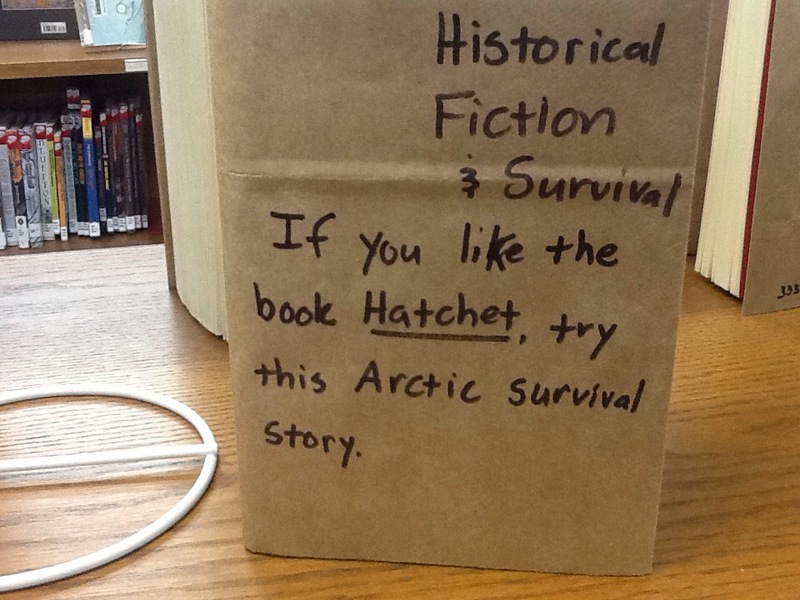 These then become available for students to take home after book check out. You can check out the current designs on our smore flyer. 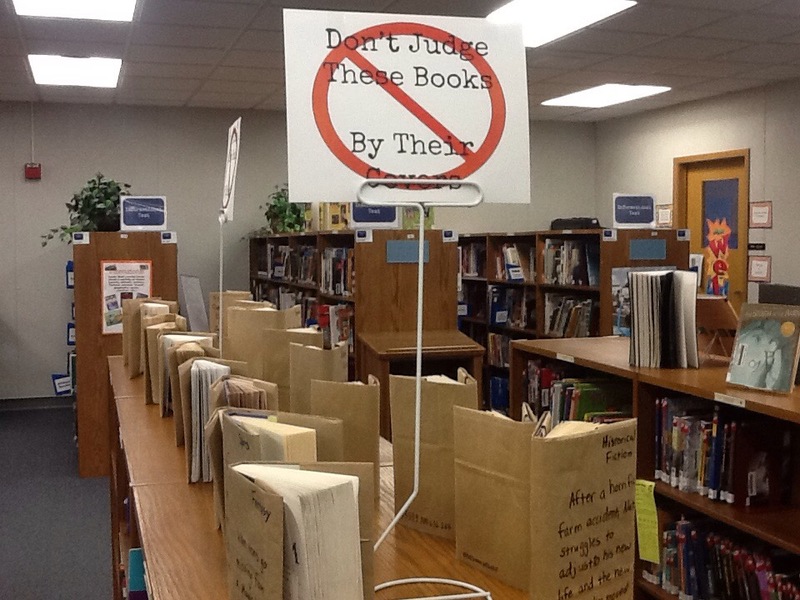 The third activity is for students to create a flag about their favorite book or series. When I was in fifth grade, I loved it when my teacher Mr. Burghy would read aloud to us. I especially loved it when my classmates convinced him to read for longer than usual or on days when he lost track of time. He could transport you to a different place with reading and had different voices for all the characters. One of the stories he read to us was The Ghost in the Noonday Sun by Sid Fleischman. That story immersed me in unexpected events, the dangers of the high seas and colorful characters I was relieved never to meet in real life! 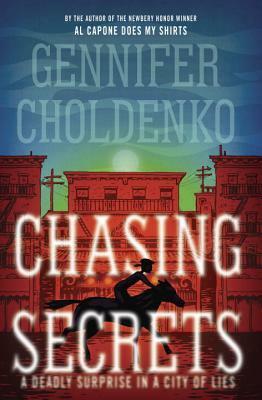 In The Vanishing Island, twelve-year-old Bren Owen feels trapped by a future he does not want. He has no desire to become the mapmaker’s apprentice his father wants him to be. So what if he can memorize the location of items with a glance or recreate complicated drawings without a second examination? It’s the Age of Discovery, and Bren is determined to be a part of it. Bren craves adventure so much that he has attempted to stow away on three different ships. He faces a list of stiff punishments while standing before the judge when the powerful Rand McNally steps in to claim the boy. Now Bren must work off his debt to McNally while working a job that would make anyone’s stomach squirm. He’s assigned to McNally’s vomitorium where he has the dirtiest of jobs. One of the vomitorium’s guests gives Bren a coin-like medallion right before dying. When a local doctor is then murdered after beginning an autopsy, it becomes clear that Bren isn’t the only one interested in the medallion. Bren chooses to join a Dutch admiral with an interest in the medallion, a choice that will take him to the sea like he has always dreamed. A choice that will teach him to be careful what he dreams of as life on the sea is quite different than the pages of the novels he once devoured. With the first installment of The Chronicles of the Black Tulip, Barry Wolverton transports his readers on a perilous journey where the dangerous and grotesque are never more than a blink away. I expect Bren Owen’s story to sweep my fifth and sixth grade students away on a gripping adventure just like Oliver Finch’s story did when I was their age. You can enter to win a signed ARC of The Vanishing Island. Fill out this Google Form by 11:59 PM on July 1st for a chance to win (US & Canada only). Regardless, in my alternate Seafaring Age, I made the Netherlands king of the European explorer nations, with Britannia a relative upstart by comparison. Which gave me an opportunity to read up on some truly weird folklore of the Low Countries, like the legend of Styf, the elf who liked to mix up everyone’s wooden shoes while they were at a party and leave them in a pile, but then redeemed himself by inventing starch — that stuff that makes your collars nice and rigid. I mean, what sort of people have a folktale about the the invention of clothing starch? A great people, that’s who! Of course, in the story Bren travels to the Far East, and both the fantastic tales told of the East by Marco Polo and the mythology native to the East come into play. The titles from some of the great works from China alone take the prize for evocativeness: The Spring and Autumn Annals; Dream of the Red Chamber; The Plum in the Golden Vase; Strange Stories from a Chinese Studio. To say nothing of dragons, monkey kings, empresses of the sky, and much, much more. But what’s really interesting is the commonalities in mythology and folklore even among cultures that seem radically different. We all have our creation stories and great floods and saviors and doomsdays in some form or another. Throughout history people have taken others’ folklore and altered or embellished it, which is exactly what I did in THE VANISHING ISLAND. In some cases I was inspired to invent new stories altogether, but I’ll leave it up to readers to parse out what’s real, sort-of-real, and unreal. Learn more about The Vanishing Island by visiting the other stops on the blog tour. Check out Walden Pond Press’s blog tour page. Disclaimer: A pre-publication copy of The Vanishing Island was provided to me by Walden Pond Press. This past school year, one of my students requested that we get more manga for our library. Our graphic novel section has a few manga titles, such as Maximum Ride, Ultra Maniac, +Anima and Warriors. I’ll admit manga is one one of my reading gaps. I enjoy graphic novels, but haven’t read much manga. I try to read any titles that come with my school’s book fairs as I want to know what those are like before my students go through the fair, but that’s about it. Laddertop by Orson Scott Card – Science fiction story where children are recruited to attend Laddertop Academy to learn the skills necessary to attend to maintenance on the Laddertop stations that ascend high above the planet. The ladders and the stations are the result of alien technologies that were gifted 25 years earlier. This read like an early young adult title. Ninja Baseball Kyuma by Shunshin Maeda – A youth baseball team is in desperate need of another player. The captain finds a candidate up on a mountain, someone the captain thinks is playing at being a ninja. Little does he know that Kyuma is the last member of his ninja clan. This is an all ages title. Case Closed by Gosho Aoyama – Life takes an unexpected twist in this title when the main character, who views himself as an excellent detective in the path of Sherlock Holmes, finds himself transformed into the form of a primary student. The crimes tend toward the macabre. A young adult title that I need to read book two of before making my mind up. 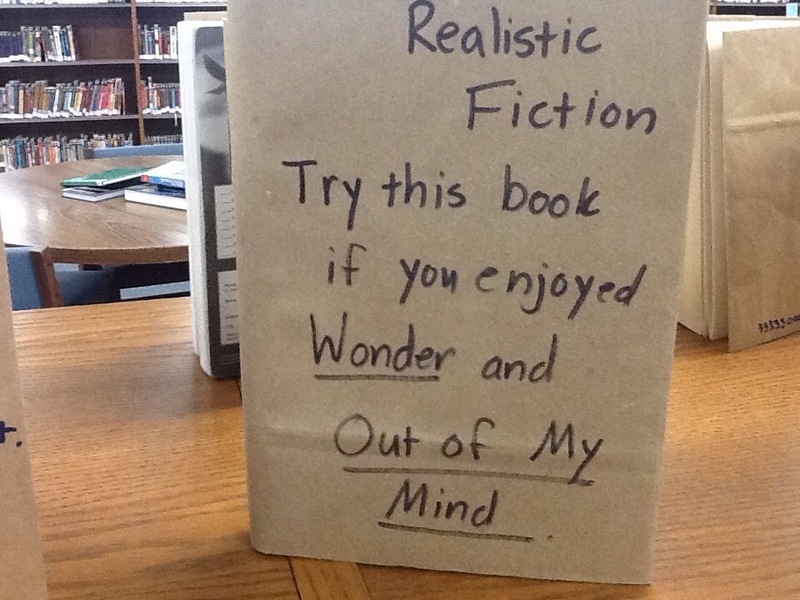 This one was recommended by a student. Hikaru no Go by Yumi Hotta – Go is a traditional Chinese game. After Hikaru finds an old Go board in his grandfather’s attick, he finds himself joined by the ghost of Fujiara-no-Sai, who taught the Emperor of Japan to play Go centuries earlier. This was more of an every ages title. Manga editions of popular teen series are also somewhat common. Of these, I have read Clockword Angel by Hyekung Baek and the first Maximum Ride title adapted by Narae Lee. Today marks the first day of summer school in my district, which offers a variety of enrichment classes in addition to skill-building classes. This summer I have the privilege to teach a class based on National Novel Writing Month’s Young Writer Program (http://ywp.nanowrimo.org/). 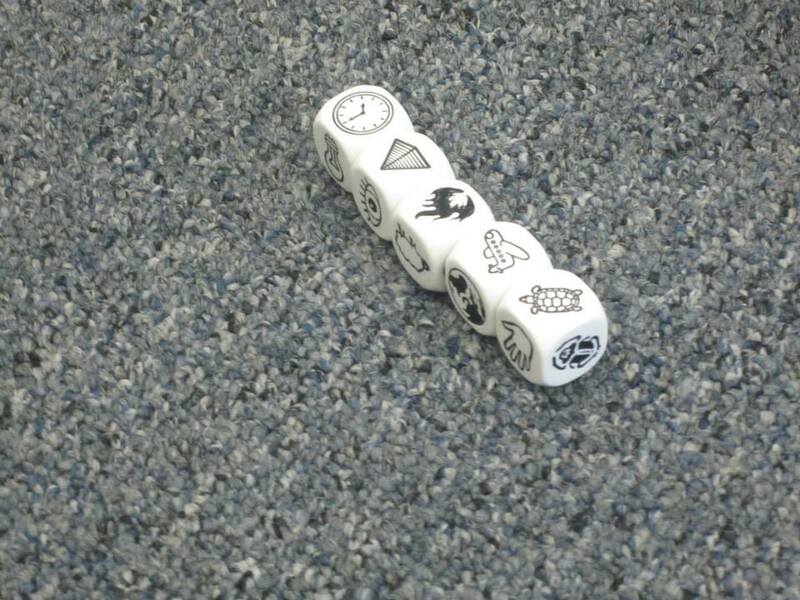 While there are several different games to play with these image-laden dice, my favorite is to have students roll for stories. I have them get into pairs. Each partner takes turns rolling the dice. 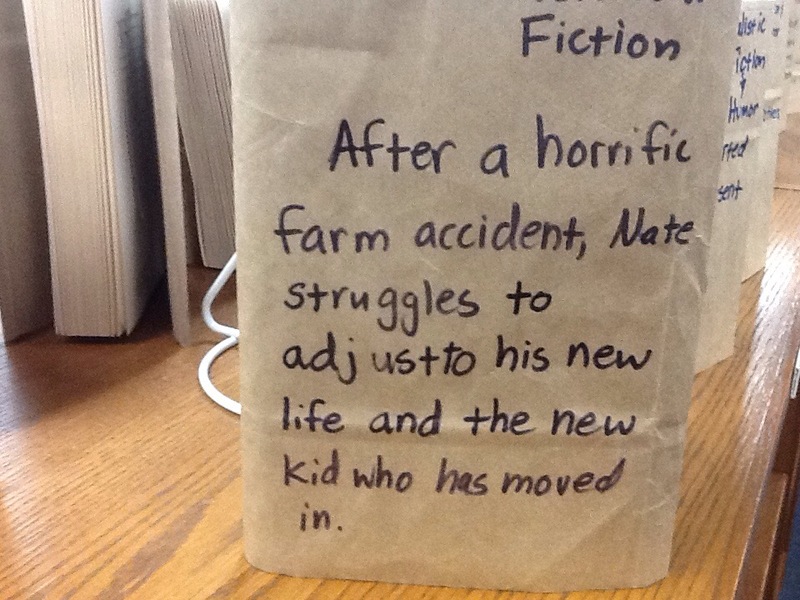 They then have to tell a short story using all the pictures that come up on their roll. For those new to the game, I might have them start with four or five dice rather than the full set of nine. For an extra challenge, I have students add expansion dice to their games. Story Cubes come in three sets: the original, Actions and Voyages. My favorite set is the Actions one as characters get into quite the predicaments. The sets are color coordinated, which assists in clean up when you have multiple sets in play between the different story groups.Mini-expansions called Mix Sets are available, such as Clues or Enchantment. These sets allow the stories to become a bit more genre specific in their prompting. 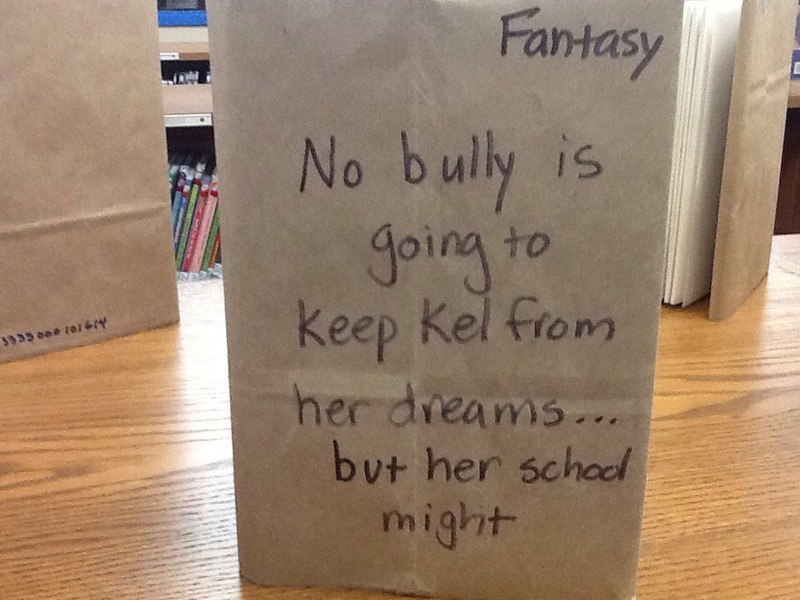 The stories that result are bound to have both your students and you laughing. Ios and Android apps also available, which gives you access to the original and the Actions cubes with the entry level price (https://www.storycubes.com/apps). Expansions are available as in-app purchases. One thing I found helpful with playing Story Cubes is to have the groups spread out well and to play on the floor rather than on the table tops. For younger players, you might want to consider this homemade dice roller (http://www.parenthacks.com/2012/09/dice-roller.html). I’m excited to have author Chris Rylander on my blog this morning. Chris writes humorous books that resonate with my students, such as the trilogy of Fourth Stall books. 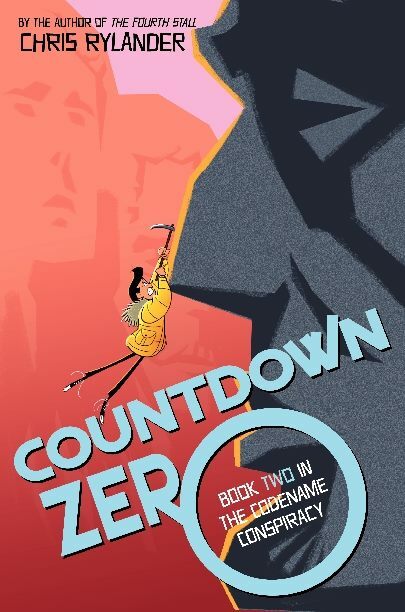 Countdown Zero is the sequel to Codename Zero. Both titles feature Carson Fender, king of pranks and unlikely secret agent. Carson makes it clear he finds Principal Gomez’s mandates incomprehensible. What is the strangest mandate the principal has issued at school for the students or teachers? In this series, Carson’s friend Dillon is very intrigued by conspiracy theories. Did you have any favorites to read about when you were a kid? All of them! I love conspiracy theories. In fact, not just as a kid, I still probably spend 6-7 hours a day on Wikipedia reading about unsolved murders and conspiracy theories. My first favorites were all of the usual big ones: the JFK assassination, the moon landing, Area 51, etc. Of course, the funny part is that while I love reading about them and find them all so fascinating, unlike Dillon, I don’t really believe in many of them. The simplest explanation is often the most plausible. That said, I wouldn’t be shocked at all to find out that at least one of those three turned out to be a real conspiracy. Carson has to visit some pretty interesting places in this book. Would you rather get stuck in Snaketown or Bear Country? If you were ever in a situation where you needed to be rescued, would you rather have Carson and his friends there to help you or Mac and his friends from The Fourth Stall? Great question! Definitely Carson and his pals, since they have access to a vast array of high-tech gadgets and weapons, and also have the backing of a powerful government spy agency. Mac is better at solving every day problems for sure, but when I think of needing rescue, I’m assuming I’d be in a much tougher spot than simply needing the test key for an upcoming final math exam. Chris Rylander is the author of the Fourth Stall Saga and the Codename Conspiracy series. A fan of brown shipping boxes turned on their sides, dance-offs to win a girl’s heart, and rice, he lives in Chicago. You can visit him online at www.chrisrylander.com. Find Chris on Twitter and his website. Everyone at his school knows Carson Fender is a prank mastermind. Principal Gomez just hasn’t ever had enough concrete evidence to prove it. Carson’s latest plan, Prankpocalypse, should have Carson humming with excitement. There’s freshly fallen snow, which is always good for a new arsenal of options. Carson’s partners in crime are hitting their school with as many pranks as possible. They’ve never attempted a scheme of this magnitude. Prankpocalypse has just one problem–at the start. After being retired from the secretive Agency that had recruited Carson to assist in thwarting the plans of an evil organization, school pranks just don’t bring the same adrenaline rush. Then other problems begin to snowball Prankpocalypse. Carson’s putting the finishing touches on a frozen replica of his insufferable principal when a frantic text warns him the principal has just arrived. It’s 2:53 AM and Carson’s stuck in the principal’s office. In the aftermath of Prankpocalypse, Carson finds himself suddenly reinstated as Agent Zero in a mission to one of the Agency’s bases where a dangerous virus has been compromised. He has three days to get to the base and save Agent Nineteen, his former mentor. Carson has to find a way onto the seventh grade field trip, which means meeting Principal Gomez’s request that he give up all his accomplices. Then there’s the small matter of breaking into secret chambers concealed within Mount Rushmore. For all of the stops on the blog tour, please click here. Chris will be at The Haunting of Orchid Forsythia tomorrow (Thursday, March 5, 2015). Over the summer, my school’s library was able to purchase a Sphero robot through a grant on DonorsChoose. Sphero has been a big hit with students in my school. About the size of a baseball, this robot can work with a wide variety of free apps and games. What I love are the possibilities for coding. Draw N Drive is a great introduction to the idea of coding and is accessible for very young students. They set a speed, colors and draw a shape. When they run their program, Sphero carries out that design. Students quickly learn spaces in their drawing don’t work as expected. MacroLab offers students more intense coding experiences. They can create looped commands, use the raw motor command to cause Sphero to flip or program Sphero to travel intricate paths. Some classes at my school have been exploring Sphero during their intervention and extension block. Fifth graders are also rotating through a Sphero station during library classes. I’ve found small groups of two or three students per Sphero work best. Larger groups can work during an introduction when we are trying out Draw N Drive. Using Sphero’s SPRK education lessons as a starting point, I created station cards that allow students to more independently explore Sphero. The cards begin with two videos on how Sphero works and then take students through Draw N Drive, the Sphero app and MacroLab. I also drew inspiration from Mrs. J in the Library’s Little Bits 101 cards. Take a peek at these SpheroIEChallenges. I also created a basic command sheet for students to use with Sphero. 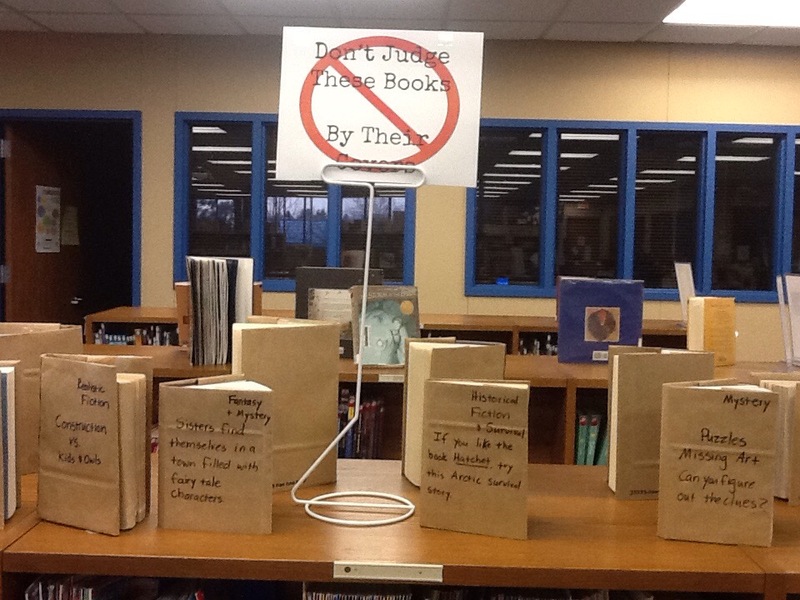 To coincide with Read Across America next week, my library is finally launching its take on blind book dating with Don’t Judge These Books by Their Covers. Two of our library volunteers paper bag covered the books the library assistant and I set aside. Today we created summaries and hooks for these books. Hoping these create some buzz next week. Can you guess which titles are included in the pictures below? Books have the ability to transport us to another time and place. They are time machines more effective than any converted car or police box. Picture books offer us an effective means to take an entire class on a journey outside their life experiences. This last weekend I had the pleasure of attending Anderson Bookshop’s 13th Annual Children’s Literature Breakfast. One thing I love about this event is being introduced to books I have not yet discovered, including the four picture books described below. This nonfiction picture book is a must read for classes using elements of the maker movement or for Genius Hour projects that focus on solving community problems. It also speaks to the power of perseverence. 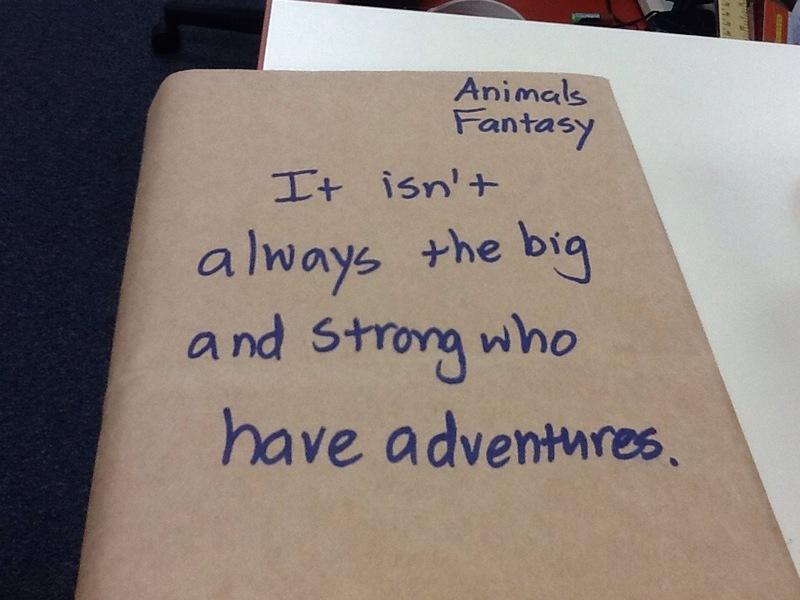 I knew just what two classes in fifth grade needed this book from the moment I started it. This book relates how the students at one Guetemalan school dealt with the need for more space. They gathered up plastic bottles and other trash from their village and from miles around to create eco-ladrillos (eco-bricks) to expand their school. They worked for 15 months to finish the project. It’s an inspiring read. I enjoyed discovering this book about the friendship between Frederick Douglass and Susan B. Anthony. Slade traces their friendship as well as what would happen when they would arrive to speak at the same place. Anthony came to the assistance of the Douglass family when their home was burned. One thing I really appreciated as a reader was the depiction of their friendship’s struggle after the passage of the 15th Amendment to the United States Constitution but were able to reconcile. This book would pair well with The Soda Bottle School. Booker T. Washington accepts a teaching job in this book in a community that does not yet have a school. After beginning classes in a shed, Washington purchases an abandoned plantation. He and the students spend long hours digging up clay and then creating bricks to build a new school building. They try using three different kilns to bake the bricks, but all of them break. When many want to give up, Washington sells his one possession of value to get one last kiln. Finally, they are able to build the school. By the time of Washington’s death, that school property would have over a hundred buildings. You can find more about Suzanne Slade’s books on her website. I find the Civil War fascinating, so I was pleased to read this historical fiction picture book. 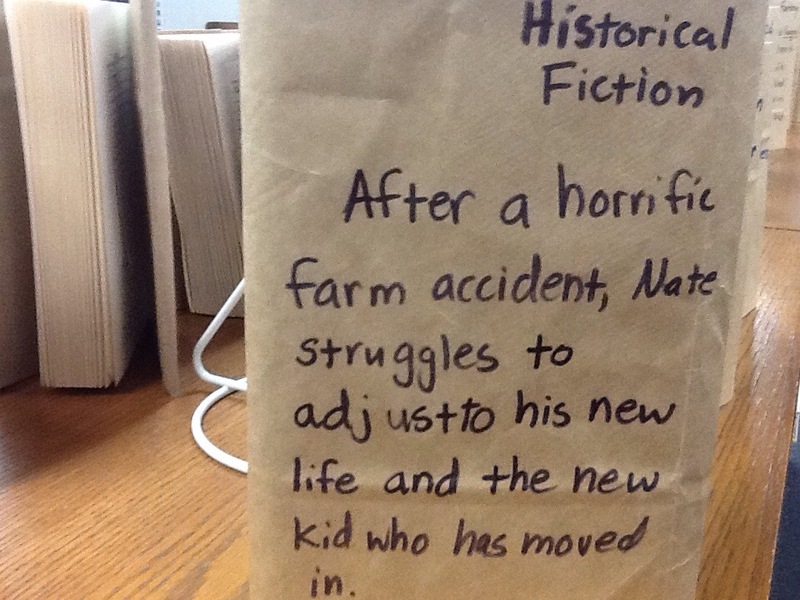 This story portrays what happened after slaves were emancipated at the end of the war. One boy goes on a long journey to try and find his mother from whom he was separated. He follows false leads and faces a number of obstacles during his search. Check out A. LaFaye’s other books.